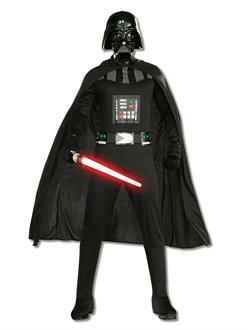 Enforce the will of the Emperor and hunt down the Rebel Alliance dressed as the famous Dark Lord of the Sith. You will feel the power of the Dark Side coursing through you this Halloween thanks to the intimidating Darth Vader Mens Costume. You will look like you’ve stepped right off the big screen in such an exciting replica of Vader’s iconic armor design. This all-black outfit’s chest features his control panel, as well as belt, and comes with an attached cape and character mask for the complete Vader look. Most impressive.